Mine operators have a new tool for identifying specific work tasks that cause high respirable dust exposure for workers. Operators can use the NIOSH-developed Helmet-CAM in the fight against silicosis, a disabling and sometimes fatal lung disease that has plagued the mining industry for years. The Helmet-CAM is a lightweight video recording system that integrates easily into a mine worker’s gear and takes advantage of other proven dust control technology. The mine worker wears a backpack, safety belt, or safety vest that holds both a video camera datalogger and an aerosol monitor connected via a cable to a small video camera attached to the helmet. As the worker proceeds with normal work tasks, the Helmet-CAM system constantly records video while the aerosol monitor takes instantaneous dust concentration readings every two seconds. After a desired period of time, this information is downloaded to a computer and merged through a new NIOSH-developed software program called EVADE (Enhanced Video Analysis of Dust Exposure). The result is a single integrated display of the recorded video above a graph, depicting the worker’s dust concentrations as measured by the aerosol monitor in real time. 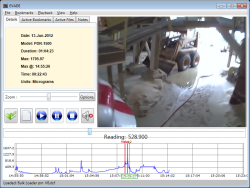 By the use of a “slide bar” that resides between the graph and the video, the EVADE software allows the user to quickly review the video footage and corresponding graphed data simultaneously, thus identifying specific work activities and areas of high respirable dust exposure. Once areas of high exposure are identified, control technology can be developed to address the problem. Integrated visual display of worker tasks recorded by Helmet-CAM (top right) and the graph of the worker’s dust exposure measured by the aerosol monitor (bottom). The top left shows the EVADE software menu. Helmet-CAM has met with a favorable response from both mine workers and operators, and has recently been successfully field tested at both surface and underground mining facilities in Virginia, West Virginia, Wisconsin, New Jersey, Ohio, and Pennsylvania. All of the hardware associated with the Helmet-CAM system is commercially available, and the EVADE software is now available for free from the NIOSH Office of Mine Safety and Health Research (OMSHR). A detailed instruction manual on using the EVADE software is also included, providing a helpful discussion of sampling equipment and sampling procedures when performing personal aerosol monitoring for mine workers. For further information on Helmet-CAM, email mining@cdc.gov.